Bet-at-Home Review: Collect up to €1,000 Today! Bet-at-Home is the ultimate online casino for players looking to enjoy the hottest slots of the year as well as casino classics from the comfort of their home. With an excellent mobile platform to boot, this latest addition to our list comes highly recommended, and below you’ll find out why! Bet-at-Home not only offers plenty of games, but as a new player you can choose between two exclusive offers depending on your budget and preference. Whether it's the larger match percentage or the bigger payout you're after, either way you'll start playing with a significant bankroll boost! To claim this bonus all you need to do is deposit at least €1 and Bet-at-Home will match the amount, allowing you do double your bankroll by as much as €200! There's no bonus code required, simply choose the option once you create your account and enjoy. If you prefer to play as a high roller, then the next offer may be even more enticing for you as it allows you to collect a lot more than a couple hundred in bonus cash! This high roller bonus is reserved for the big spenders, who can collect up to €1K on top of their deposit as long as they drop a minimum of €500 in chips. Bet-at-Home will then match your payment by 50%, giving you a great head start for when you decide to the hit the tables or reels of your favorite real money games! At Bet-at-Home you will find an extensive collection of games including slots, classic table games, video poker and a live casino section as well! Enjoy the Latest Slots at Bet-at-Home! Whether you enjoy massive progressive jackpots or prefer slow and steady wins from low volatility games, you can find nearly anything at Bet-at-Home! The long list of incredible video slots includes newer hits like Starburst, Spiñata Grande, Dazzle Me and Cosmic Fortune. Not to mention the 7 figure jackpots often found on Divine Fortune and Cosmic Fortune! There’s a lot more to this incredible gaming experience than just slots, and you can switch things up with dozens of casino games which we’ll cover next. Table Games at Bet-at-Home: Roulette, Blackjack, Video Poker and More! This casino does a lot more than offer colorful slots, and you can find a huge selection of traditional casino games in various sections of the site! 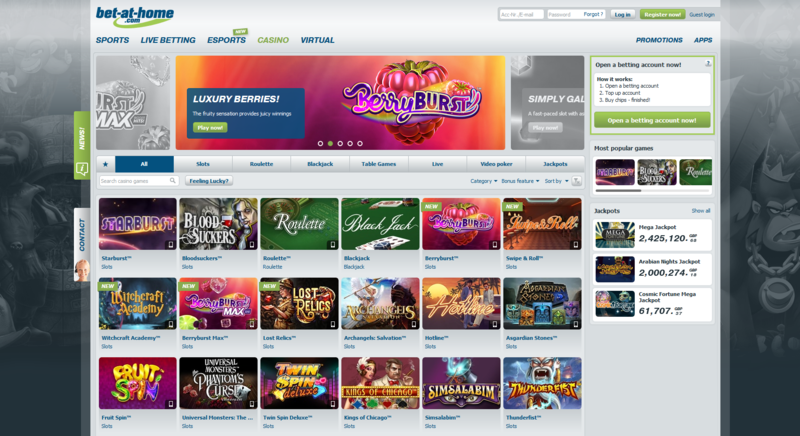 Roulette, blackjack and video each have their own dedicated section with plenty of unique variations from side bet options to regional versions of each game. The video poker selection hosts the highest RTPs around with titles like Joker Wild, Jacks or Better among others. Under table games you’ll find even more games including baccarat, pontoon, red dog and various forms of poker including Caribbean Stud and Texas Hold’Em. Don’t Miss Bet-at-Home’s Live Casino Section! Yet another great aspect of Bet-at-Home’s collection is their range of live casino tables! Roulette and blackjack fans can enjoy plenty of live sessions of these popular games, allowing you to play for real money from home with the added thrill of a live dealer. Members of Bet-at-Home can also play all casino games from a mobile friendly version of the site. Simply log in through your smartphone or tablet browser and continue playing any featured game. You can also continue making deposits and withdrawals, and the site is both Android and iOS friendly! At Bet-at-Home you can contact a live team of customer support agents through live chat or one of the various telephone numbers available on the site. There is also an extensive list of FAQs, where most of your questions are answered, and a contact form if you prefer to send your questions or concerns by email. Either way, their team is at your disposal 24/7! This online casino may be a new addition to our list, but is far from lacking both in terms of generous bonuses for new players and enough games to keep long-time players entertained. In addition to a great gaming experience both on desktop and mobile, this online casino offers incredible customer support, making it one of our newest recommendations for UK-based casino lovers. There are many deposit options on Bet-at-home. You can choose the most convenient one for you. The bonus offer is only valid for customers who have never purchased casino chips in the bet-at-home.com casino. As a basis for calculating the bonus amount, the value of the first chip purchase will be used. The bonus will be granted if you buy chips worth at least 1.00 EUR. The bonus will automatically be activated when purchasing casino chips. When buying chips up to 499.99 EUR, the bonus will amount to 100%, up to 200.00 EUR. When buying chips worth 500.00 EUR or more, bet-at-home.com will credit 50%, up to 1000.00 EUR, to your account. Customers can only redeem one variant of the bonus. Customers from Slovenia can only take advantage of the 100% bonus up to a maximum of 200 EUR. The stakes will be taken first from real money and then the bonus. The bonus amount must be rolled over 30 times within 28 days. If this condition is not met or the amount of chips sold includes linked bonus money, the bonus will automatically be cancelled. 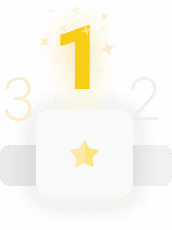 Winnings obtained with bonus money will only be converted into real money once the bonus amount has been completely rolled over. In order to make a withdrawal from your bet-at-home.com account the bonus amount must be rolled over 30 times. You can find the up-to-date rollover info in the bonus info box under the casino bank. This bonus is exclusively valid for the bet-at-home.com casino. Live casino and all other products are excluded from this bonus offer. The bonus is limited to one betting account per person, family, household and computer. By suspicion of abuse via multiple registrations (fictitious accounts, game communities), as well as balance betting, bet-at-home.com reserves the right to withdraw the bonus and any resulting profits. Purchasing casino chips with sports bonus money is not possible. For the following games, 10% of the stake will be used to calculate the required rollover: all blackjack games (incl. mini-version), Baccarat, All American, Jacks or Better, Punto Banco, Oasis Poker, TXS Hold&#39;em, Pontoon, Deuces Wild, Joker Wild. 0% for Casino Hold&#39;em, 25% for roulette. 100% for all other games. For customers who have received a special bonus offer via e-mail or via other channels, the participation conditions stated in the offer apply. By redeeming the bonus the player accepts the bonus terms and conditions as well as the general terms and conditions of bet-at-home.com which can be found at www.bet-at-home.com. bet-at-home.com reserves the right to amend or cancel this offer at any time at its own discretion.